Calypso is generally considered to be the nymph daughter of Atlas, by an unnamed woman; although in other ancient sources a Calypso is named as both an Oceanid, daughter of Oceanus and Thetys, and a Nereid, daughter of Nereus and Doris, although these could be three different Calypsos. 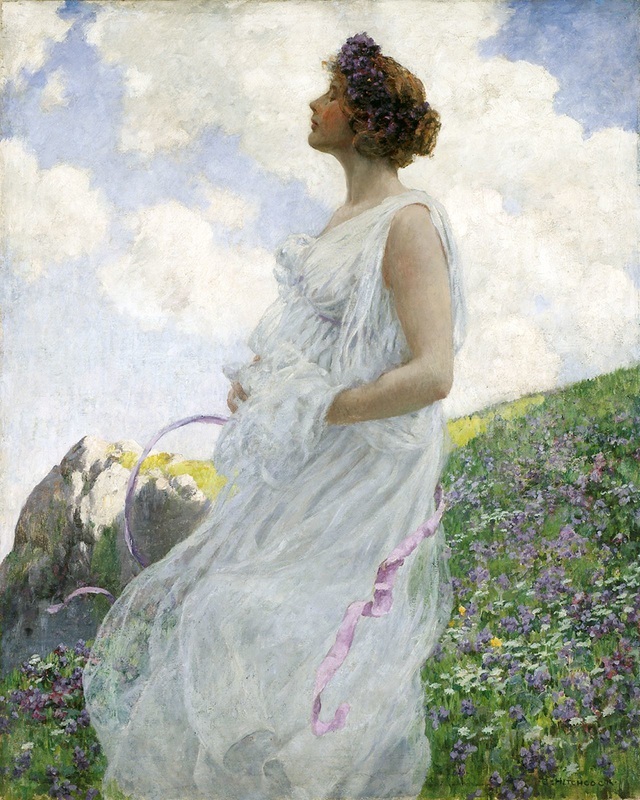 The nymph daughters of Atlas were named amongst the most beautiful of all immortal goddesses, and Calypso was no exception. Calypso though did not display her beauty as part of the retinue of one of the more famous goddesses, like many other nymphs, for Calypso had made her home upon the island of Ogygia (potentially the island of Gozo). Calypso comes to prominence when the Greek hero Odysseus arrived upon Ogygia. Odysseus had already faced many trials and tribulations upon his return journey from Troy. The latest misfortune to face Odysseus had seen the loss of his final ship and men, when Zeus had destroyed them to appease Helios. Odysseus had survived by fashioning a raft from the remnants of his ship. For nine days Odysseus had drifted and paddled, before washing up on the shoreline of Ogygia on the tenth day. 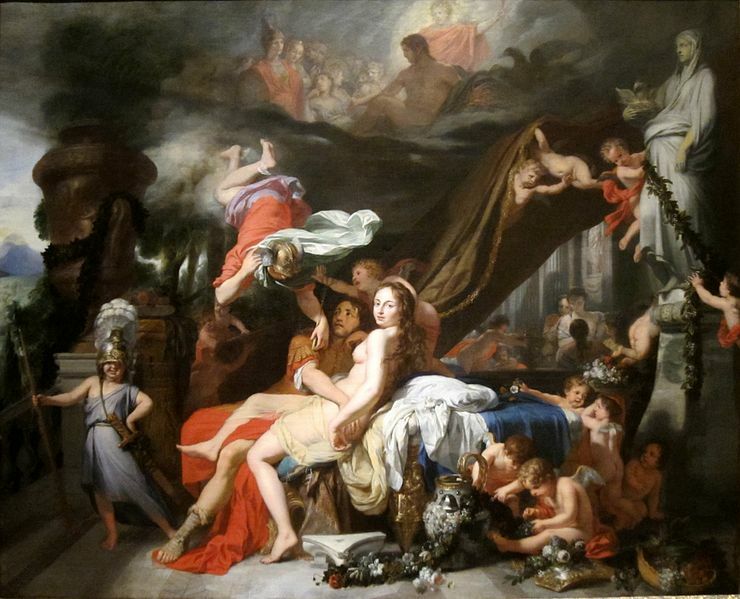 Calypso would rescue the shipwrecked hero, and Odysseus was nursed within the home of the goddess. 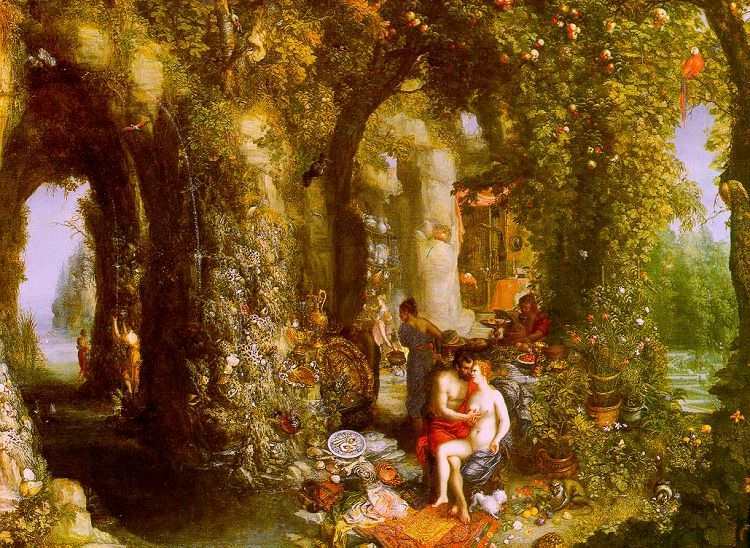 The home of Calypso has been referred to as both a cave and a palace, but in either case it was said to be a beautiful place surrounded by trees, vines, birds, animals and babbling streams. Later imaginings of the palace of Calypso would also see the nymph also have female attendants herself. As she nursed Odysseus, so Calypso fell in love with the Greek hero, and was soon offering to make the King of Ithaca her immortal husband. Such an offer, of eternity spent with an un-aging beauty might sound unmissable, but Odysseus refused the goddess’ offer; for Odysseus was still longing to return home to his wife Penelope. So at night, Odysseus would share Calypso’ bed, but everyday he went to the shoreline, looking out in the direction of Ithaca. 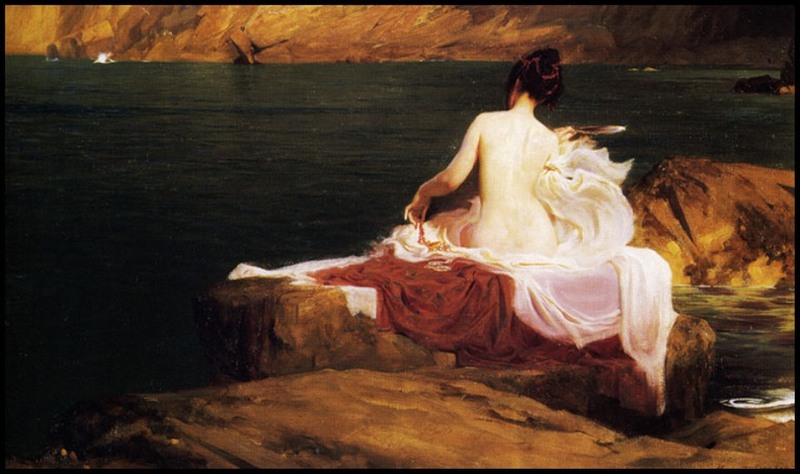 Despite the beauty of his companion, and his surroundings, Odysseus simply viewed Ogygia as a prison, and for several years Odysseus would remain. The length of Odysseus’ confinement was seven years according to Homer, although others say that Odysseus was on Ogygia for only one or five years. Eventually, the goddess Athena, who was an ally of Odysseus, came to the rescue of the Greek hero, for Athena went to her father Zeus, to ask that he command Calypso to release her captive lover. Zeus acquiesced to Athena’s request, and Hermes was dispatched to pass on Zeus’ command. Whilst Calypso would welcome the arrival of Hermes, she would not welcome the news that the messenger god brought. Calypso felt that she was being unfairly treated for it seemed to her that the male gods of Mount Olympus could do as they pleased with mortals, and yet goddesses were not allowed the same sort of freedom. Of course, Zeus himself had abducted Ganymede, and the Trojan prince was still to be found upon Mount Olympus serving the ambrosia and nectar. Calypso though ultimately had no choice, and so the goddess told Odysseus that he was now free to leave. Calypso would indeed provide Odysseus with materials for a new boat, as well as provisions for a long journey across the sea. Thus in a short time, Odysseus was leaving Ogygia and Calypso behind. The time that Odysseus and Calypso spent together was said to have brought forth several sons for the goddess. Hesiod (Theogony) would state that Calypso bore two sons, Nausithous and Nausinous, whilst other ancient sources also name Latinus and Telegonus as sons of Calypso, although these are more commonly named as sons of Circe. In the Fabulae (Hyginus) the claim is made that Calypso committed suicide after the departure of Odysseus, although an immortal committing suicide would be virtually unknown. Others simply say that Calypso pined for her lost love, looking out into the open expense of the sea, in the direction that Odysseus had departed.